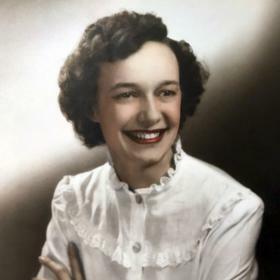 Margaret Rose Feucht, age 91, of Boca Raton, Florida, passed from this earth and was born to eternal life in heaven, joining Our Lord, Jesus Christ and her husband Reinhardt on November 7. Margaret was born in Milwaukee, Wisconsin on December 16, 1925, the eldest child of Joseph and Elsie Meyers. She was preceded in death by her husband Reinhardt Joseph Feucht, her brothers Howard and Eugene, and her granddaughter Margaret Allison. She is survived by her six children, Kathy (Dave) Hyde, Terri (Perry) Oksiuta, Mij (John) Byram, Thom Feucht, Jerome (Marcela) Feucht and Mike (Kathy) Feucht; by her grandchildren Ben Oksiuta, Jessica Kosempa, Anna Feucht, Calla Feucht, Chloe Feucht, Greg Hyde, Alex Hyde, Nicki Byram, Carolyn Kirschmann, and Madeline Rose Feucht; and her great-grandchildren, Damian, Reese, Julian and Connor. 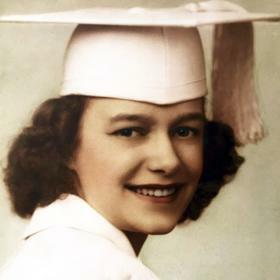 Margaret graduated from Mercy High School in Milwaukee, class of 1943. She met and married Reinhardt Feucht while working at Marquette University. 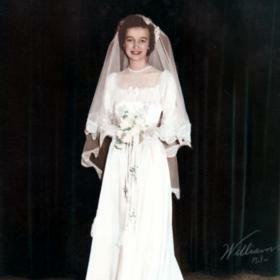 They wed on May 29 1948. She started her working years in the Fabric Department in the basement of J.C. Penny at Elmwood Plaza, later working at Minnesota Fabrics. In 1969 she graduated from Dominican College with a B.S. in Psychology. She was widowed 46 years ago, in November of 1971. From 1972 to 1978, she worked at Shoop/Becker Geriatrics. In 1979 Margaret moved to Sarasota Florida and took a job at Sarasota Memorial hospital as a ward clerk. She retired in 1996 and moved to Boca Raton, Florida, where she continued to volunteer at the local hospital thrift store. 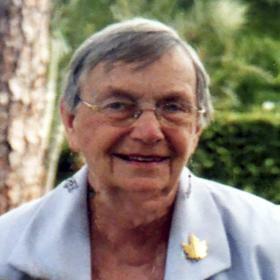 Margaret was a longtime member of Holy Name Parish in Racine and St. Jude's in Boca Raton. She loved the Packers, the Fighting Irish, and the Badgers, but not always in that order. 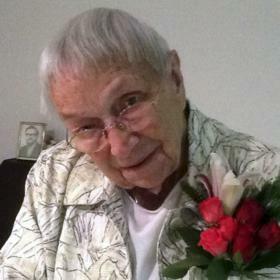 She loved to sew and knit and was and accomplished seamstress and was knitting mittens even in her final months. But what brought her greatest joy was visiting and spending time with her grandchildren and great-grandchildren. Instead of flowers, the family suggests a donation to one of Margaret’s favorite charities; St. Jude Children’s Hospital(www.stjude.org/donate), Habitat for Humanity (www.habitat.org/Giving/Donate), and Boy’s Town(boystown.org). Additionally, her children suggest considering a donation to the hospice care organization whose loving staff helped bring peace, comfort, and grace to Margaret’s last days on earth (VITAS Health Care, VITASCommunityConnection.org). Visitation with Margaret’s family will be on Saturday, November 18 beginning at 9 a.m. at St. Paul the Apostle Catholic Church (6400 Spring St, Mt Pleasant, Wisconsin), followed by a Memorial Sservice at 10:30am and interment at Holy Cross Cemetery. The family invites all of Margaret’s friends and relatives to join them at Mike and Angelo’s Italian Restaurant (6214 Washington Ave, Racine) at 1:00pm for dinner, fellowship, and remembrances.